During Wisconsin's long, bitterly cold winters, the only things that grow are snow banks. 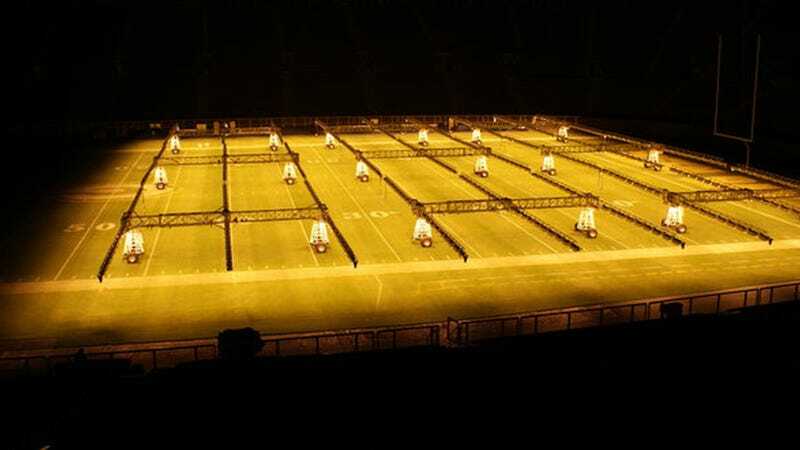 So to keep Lambeau Field's turf in game shape for Sunday, the Packers roll out these massive Friday night lights. Built by Stadium Grow Lights (SGL), a Dutch firm that services a number of professional soccer pitches throughout Europe, these mobile grow lamps are designed to illuminate the sections of a field that receive little or no natural light due to the construction of the stadium. Packers Stadium was the first pro stadium in North America to use the system when trials began in October 2010. The lights worked so well that the Packers organization ordered another nine units ahead of the 2011 season. They now run nearly constantly from October to the first week in December. The lighting rig itself is made from a grid of retractable metal, housing hundreds of 1000 watt light bulbs. And when combined with the stadium's sub-soil heating system—a network of antifreeze filled pipes running under the turf to keep it from freezing solid during Green Bay's wicked cold winters—the SGL lighting system is even more effective. “The grass is great looking, it’s thicker and healthier, mature, and fuller,” field manager Allen Johnson told the New York Times. “We try to get the grass as healthy as we can before the start of the season. The lights and heat from the coils underneath the field are a good combination and complement each other. By the start of December we have a pretty full canopy.” Ground crews monitor the light output and record a variety of data points on the field's condition daily. The Packers' success has now led other professional franchises to look into the system as well, including the Houston Astros and the New York Red Bulls, whose stadium design prevents adequate sunlight from reaching one of the penalty boxes for nine months out of the year. “The year before, it was definitely brown and it didn’t look right,” said Dan Shemesh, director of grounds for the Red Bulls, told the Times. “You could always tell the south end: the air was colder, the soil was colder, the grass was thinner. It didn't need to be mowed much.” But now, boasts Shemesh, “This past year, actually, that end was better than the other end."